Wat Phnom is the small mountain temple - the highest point in the city - from which Phnom Penh takes its name. It’s a pleasant spot for a short visit and it's close by some of the city's colonial architectural landmarks. Legend has it that Phnom Penh’s first pagoda was built on this site in the 14th century after a woman named Penh placed four bronze Buddha statues here. Many renovations and reconstructions later, the site is still revered by locals - and is also a magnet for hawkers and beggars. The current pagoda dates back to the 1920s and features some colourful Buddhist frescos. When the French stepped up their planning and development of the city in the early twentieth century, they selected the area overlooked by Wat Phnom for the location of many of the grandest colonial era buildings including the Post Office and the Hotel Le Royal. 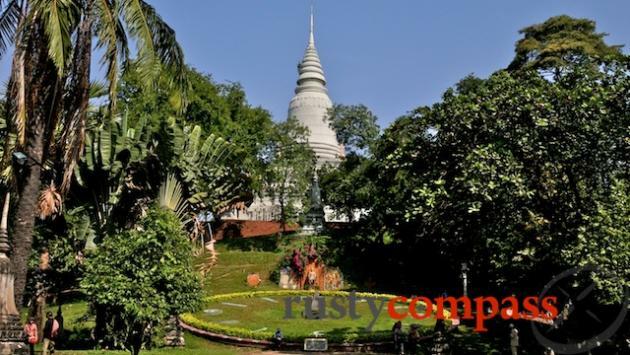 Wat Phnom is no major attraction but paying homage to the city’s original wat is a nice and convenient thing to do given the central location and its proximity to some of the city’s colonial architecture. 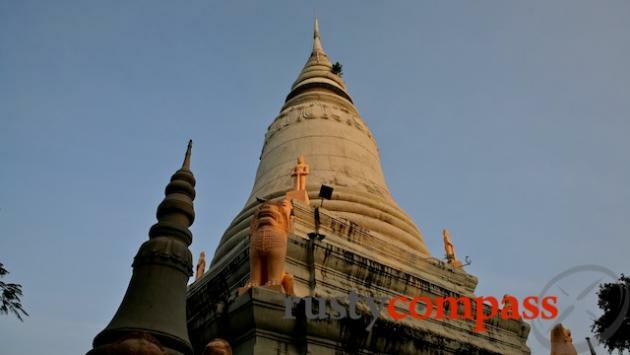 Wat Phnom is located nearby the new sprawling US Embassy, the historic Raffles Le Royal Hotel, the French colonial era library and not far from the Post Office - all landmarks worth a look. The area is easily traversed on foot.